A string of actions taken by Wipro in the last few quarters, including divestment of the data centre business and hiving off the India unit, seem to be paying rich dividends. This has led to the company recording healthy growth in revenues and profitability in the third quarter of the ongoing fiscal year. The Bengaluru-headquartered company, however, sounds guarded with regard to its growth outlook as reflected in a seemingly conservative revenue guidance for the March quarter. Also, the Wipro board approved an issue of bonus shares wherein shareholders will get one bonus share for every three shares held by them. 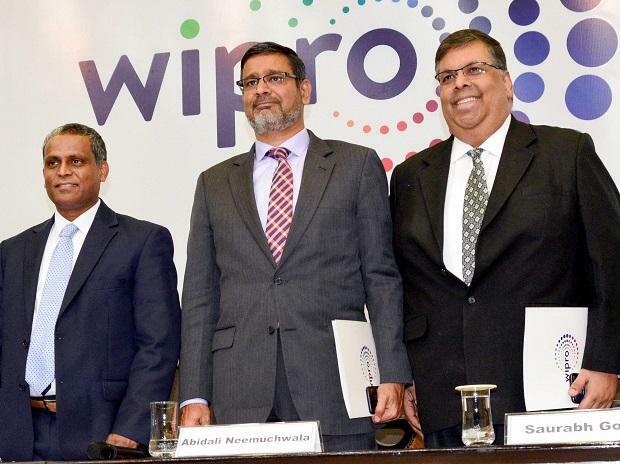 For the quarter ended December 31, 2018, Wipro reported a better-than-expected consolidated net profit of Rs 2,544 crore, an increase of 31.8 per cent over the same period of the previous fiscal year while sequentially it saw a jump of 36 per cent. The flagship IT services business, which accounted for almost 97 per cent of its overall revenues, saw a net profit of Rs 2,510 crore, a year on year (YoY) growth of 29.6 per cent. On a consolidated basis, the company’s gross revenues of Rs 15,060 crore grew 10.2 per cent on YoY basis and 3.6 per cent sequentially. A Bloomberg estimate based on consensus analysts’ poll had projected Wipro’s net income and revenues at Rs 2,313 crore and Rs 15,167 crore, respectively. Revenues from the IT services business stood at Rs 14,666 crore, an increase of 13 per cent over the same period of the previous fiscal year, while it grew 3.5 per cent sequentially. In dollar terms, IT services revenue stood at $2.046 billion, an increase of 7 per cent YoY and 2.4 per cent sequentially in constant currency basis. 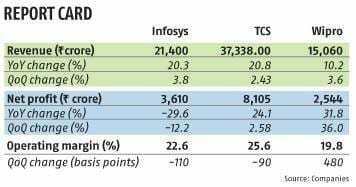 Meanwhile, industry leader Tata Consultancy Services (TCS) last week reported a revenue growth of 1.8 per cent in sequential terms (on a constant currency basis). For Infosys, it was at 2.7 per cent. “We saw a strong performance in the third quarter where our revenues and operating margins have shown robust growth backed by our solid execution capabilities,” said Abidali Z Neemuchwala, chief executive officer and executive director at Wipro. Growth of the company in Q3 was well supported by accruals from the Alight HR Solutions contract as a part of which it had acquired the US-based company’s India unit that shut in August last year. In Q3, the company saw a 480 basis points improvement in its operating margins to 19.8 per cent on a quarter on quarter (QoQ) basis. Carving out Indian business as a separate unit in the last quarter also helped the company improve profitability in the October-December period. “While factors like separation of Indian business improved offshore mix and operational efficiency contributed around half of the increased margin, the rest came from cross-currency gains,” said Jatin Dalal, chief financial officer at Wipro. “We are going to invest part of the benefit accrued from this margin for expansion into newer technology areas and in our people,” he added. However, despite posting better-than-expected numbers, the company gave a subdued revenue guidance for the fourth quarter, largely owing to macroeconomic factors. The company said it was expecting its Q4FY19 revenues to be in the range of $2.047 billion-$2.088 billion, a rise of 0-2 per cent on sequential basis. “While margin performance surprised positively, the growth in net profit was largely led by lower tax and higher margins,” said Sanjeev Hota, AVP Research at Sharekhan. He said the guidance for Q4 was softer than expectations owing to weak HPS revenues (the company they had acquired in 2016) and macro concerns. In the December quarter, while banking, financial services and insurance vertical grew 5.3 per cent in sequential terms, energy, natural resources & utilities saw a 3.6 per cent growth. Manufacturing and technology segments, however, saw a decline in growth because of seasonality.